Location: Saint-Bauzile, in the Lozere departement of France (Languedoc-Roussillon Region). Notes: Château de Montialoux is a castle located above the eponymous village in the municipality of Saint-Bauzile Lozère, France. It is now in ruin state but is easily accessible.Montialoux was the center of one of the five commandments of the barony of Tournel. This barony was his main castle in the Lot valley, but had several areas in the Valdonnez. 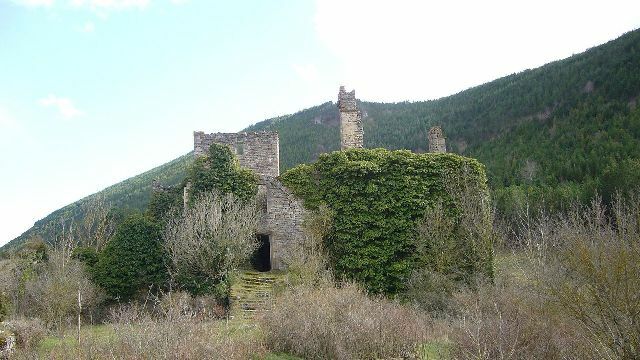 This castle of Tournel, the barons were then abandoned in favor of that of the Boy, is perhaps more recently than Montialoux. Montialoux could be one of the first possessions of the family. So Aldebert III du Tournel, future bishop of Mende was born in Montialoux 1100, and then nothing proves that Tournel has already been erected in the castle.In 1588, the particular states of Gevaudan list the castles destroyed so they can not be a refuge for Protestants. Montialoux is on the list, but there is no evidence that he actually was destroyed in that time.It seems that a new home was built in the 1660s and the castle has served up residence 1782. On that date, Charlotte and Lafayette Chavanhac Knight own them, and sell it to Guillaume Perrier, King's counsel and gentleman of Gevaudan. The assets of the Perrier family will be sequestered during the French Revolution.It is then sold several times. In 1932, the deed of sale specifies that it is already in a state of ruin.